I signed and paid for a premium account a week ago, and have tried a dozen times to get the home the plan says I will receive...still no home. 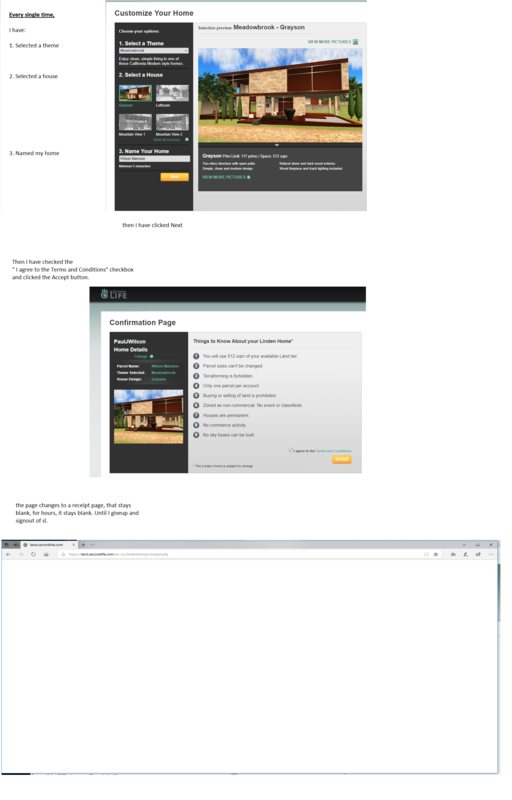 Support is giving me the run around, blaming me for not selecting a house, which I have...I had sent them an image of the page. There are only 3 steps on the first page, c'mon! of course I did that. no help. Izzy ought to know. He's pretty sharp, and it does sound like a browser issue. Linden Lab web sites are optimized for Chrome, but Opera usually works well too.I rarely use IE for anything, so I can't say how well it works for LL web sites. If you have cleared your browser's cache and refreshed the Linden Homes page and it's still not working, I suggest calling Live Chat on Friday (tomorrow's a holiday) to see if they can sort it out for you. He meant, clear your web browser's history and cookies and try reloading the web page. If you cleared your SL viewer cache, that wouldn't do anything useful.